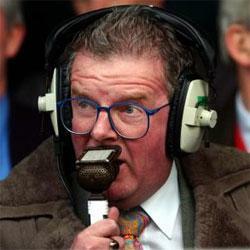 On October 9 1971 John Motson, beginning his year’s trial with BBC TV, commentated on a 0 – 0 draw between Liverpool and Chelsea. Forty years and by his reckoning about 10 sheepskin coats on and he is still providing the words to colour in sporting pictures on our screens, most memorably for some of us Ronnie Radford’s 1972 FA Cup goal against Newcastle. Motty is a national treasure, rarely ruffled. His reaction to David Beckham’s vital free-kick equaliser against Greece in a 2001 Euro qualifier, however, let the mask of neutrality slip for a few seconds, his voice for a moment only audible to dogs. We salute his professionalism, his gentle good humour, and his passion for the game, traits that make him rather more of a hero than many of those he watches today.